** Update: We apologize to those users who received the email blast after the contest had already closed. In light of that technical issue, we considered every comment on this post as an entry in the contest. Congratulations to our winners! This time of year always calls for stretchy, elastic pants on account of all the food we consume at holiday parties. But as long as they keep making yoga pants and big sweaters to cover our food bellies we can keep on eating! 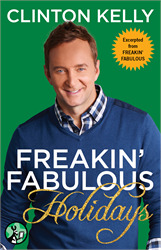 Try some of these delicious recipes from Clinton Kelly’s Freakin’ Fabulous books! If you love spending time in the kitchen (or even if you’re not the expert at cooking! ), check out the contest at the bottom for your chance to win scrumptious recipes from two great authors! For the perfect (and super easy!) appetizer for any holiday party, try Clinton Kelly’s fabulous Salmon Mousse! This recipe can be found in his new eBook, FREAKIN’ FABULOUS HOLIDAYS! I poach my own salmon for this, rather than use canned. It’s really easy. Fill a large heavy skillet with enough water to cover the two salmon fillets. Place the salmon fillets, skin side down, into the water and simmer, covered, for 8 minutes. Note: If you are poaching the salmon fillets to be eaten alone or over greens, you can poach them in a broth of 50 percent white wine, 50 percent water, and season the broth with kosher salt, cracked peppercorns, and lemon slices. When the salmon is done, remove from the liquid and place on a clean towel to drain and cool to room temperature. Then, remove the skin and flake the salmon into small pieces. In a large mixing bowl, add the gelatin and the cold water. Stir to combine. Then add the boiling water and stir until the gelatin dissolves. Cool to room temperature. Now add the flaked salmon, mayonnaise, lemon juice, onion, salt, dill and hot sauce. Stir to blend completely and refrigerate for about 20 minutes. In a separate bowl, whip the cream until it is thickened to soft peaks. Fold gently into the salmon mixture. Transfer the mixture to a nonstick decorative mold or glass bowl or baking dish lined with plastic wrap. Cover and chill for 4 hours. Serve on pumpernickel toasts, no crusts. Top with some cucumber and dill sprigs. And when it comes to main dishes this holiday season, there’s nothing like Clinton’s mouth-watering SCALLOPED SWEET POTATOES, which also happens to be a very budget-friendly recipe. This recipe can be found in FREAKIN’ FABULOUS ON A BUDGET, out now in hardcover and e! In a buttered casserole dish, place a layer of potatoes and then a layer of the cheese sauce. Repeat until all the potatoes and cheese sauce are used. Sprinkle the remaining ¼ cup shredded cheese and the grated Parmesan over the top. These recipes offer a little something for everybody! So tell us in the comments below, do you prefer sweet or savory, and why? Be sure to answer in a comment below by 9 a.m., Saturday, December 7, for your chance to win! 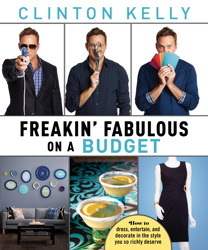 Grand prize winner gets a copy of Freakin’ Fabulous on a Budget by Clinton Kelly, a copy of The Tucci Cookbook by Stanley Tucci and a $50 gift card to Williams Sonoma to help stock the kitchen with everything you need. One grand prize winner and two winners will be chosen at random. **Click here for complete contest rules. Clinton Kelly--America's favorite expert on, well, everything--applies his brilliant sense of style and humor to all aspects of life, from dining and entertaining to decorating and etiquette. And he does it all without spending a fortune! I prefer savory dishes – it’s great to have something warm and comforting when it’s super cold outside! I love anything that is festive and easy to make. I have lots of potlucks for work to cook for. I prefer savory with a touch of spice & sweetness, if that’s allowed! Savory foods tend to be nice and filling and I love when all the tastes really compliment each other. I love Clinton Kelly! He is so funny and I’m sure he makes some amazing meals and snacks. Stanley Tucci, I mean come on! He is a super star and he cooks? Sounds perfect to me! I thoroughly prefer savory and lots of it! I adore all herbs and spices. My daughter tells people how I put chili flakes and garlic on my ice cream! What a fabulous trio to have your back as the hectic holiday season is on us. Please rescue me! The cookbooks look like huge.fun to read as well as.cook. I love both! That is why even if there isn’t a big group over for Christmas I like to have a decent spread with a variety of savory & sweet items that pair together perfectly. I always choose sweet. It’s hard to go wrong with chocolate or sugar! Why choose?? You can do so much with both. I love experimenting with baking and you can do so many variations on savory food. I love making new recipes. What a great giveaway! Messrs. Kelly and Tucci would make awesome dinner guests … or hosts! I prefer savory to sweet because I feel there’s more variety of flavor possible with savory items. All my favorite comfort foods are savory! I’m a savory type of gal, lol. But who doesn’t love sweets? Do I really have to pick one? When it’s cold like it is where I am right now I prefer savory with lots of butter. I prefer savory because I can eat it throughout the day. Sweets are only after I eat, otherwise all the sugar gives me a headache. Savory means comfort to me and I love comfort foods! I love savory the best. If you really love it you can eat as much as you want. Chocolate cheesecake is amazing, but you only get a few bites! I love both — especially sweet AND savory combined in interesting ways….salted caramel, chili chocolate — maple bacon cupcakes..
Sweet, always sweet!! That’s what my Nana always did!! All sweets made from scratch. I like dishes that are savory, as they remind me of what my Mom and Grammy use to make. Comfort food that is always satisfying. I enjoy sweets in my desserts. I admit it! I’m a sweet kind of girl all the way! Nothing like that perfect bite of rich, ooey, gooey, goodness. It just makes me happy! And speaking of Happy… Clinton Kelly, Stanley Tucci and William Sonoma, Gah! Heaven. I’ve always had a sweet tooth, but lately have really started to appreciate savory dishes. Tough choice, but I’ll go with savory. I love sweets but like just about anything cooked for me. I want a chef. I prefer savory, it lets me play with my herbs and spices while allowing for a veritable cornucopia of fresh flavors. I normally go with the savory dishes so that I can balance out all the sweets that my sister makes. I’m definitely a sweets lover! The flavor always remind me of learning how to bake (cookies, cakes, pies – you name it!) with my Aunt. I prefer sweet… but NO marshmallows… because it’s what I grew up with. Nothing like my mom’s stove-top recipe to bring back memories! Savory! Goes better with the wines I like. Love these cookbooks. I used to prefer sweet but now I love savory. After awhile sweet just tastes the same but savory offers so many different flavors. Definitely sweet especially anything chocolate. I love those recipes which offer a bit of both – sweet and savory! The scalloped sweet potatoes sound absolutely perfect! Already some amazing recipes above! 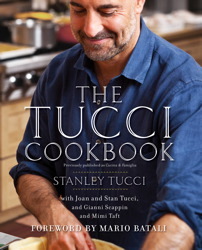 If I don’t win I’d definitely buy at least the Stanley Tucci cookbook. I don’t entertain much but I love good, quality Italian food! I prefer savory, more variety and more filling on the most part. Savory food is my favorite. Even when I eat sweets, I like sweet and salty or like to experiment with savory herbs, like rosemary or basil, in my sweets. Clinton and Tucci a perfect combination for a fab holiday season! I hope the contest is still open since I first received the email at 9:02 CST. Oh sweet all the way. Oooh! These look great! I will always pick sweet over savory–but savory is pretty darn good, too! (To use a metaphor…savory is the cake and sweet is the icing….uh, maybe that’s not the best example!) Cheers! That’s a toughie, because I do like both sweet and savory. I’m going to go with savory today, because my husband is making tinga chicken (which, to be honest, has a little sweetness, too). I love the comforting aspect of savory, and how it awakens my taste buds and satisfies my appetite for a little bit of spice. Savory. It sticks with you in the cold winter months long after sweet has gone. I prefer savory over sweet. I rather eat more savory over dessert. Why??? My taste buds appreciate savory. As I grow into my 60s I find myself changing from a sweet to a savory preference person as the savory has lasting power while the sweet, though delicious, is more of a flash in the pan. Savory with most veggies/meats, sweet with desserts! The book looks great. Always interested in new ideas, even with celiac. RICH & DELICIOUS I CERTAINLY WOULD LOVE TO TRY THESE RECIPES THANK YOU. I prefer savory. I have never had much of a sweet tooth. Got to have it all, sweet, savory, salty, and all yummy! Savory at the holiday parties. The amazing blend of flavors, spices, meats and and other ingredients can’t be beat. You can have sweets year round,but the once a year savories? yum! I prefer savory because to me savory has more interesting flavors. Sweet, can’t get enough ! I’be always prefer sweet, but every now and then you need something succulent and savory. I prefer savory as it is not sweet, but so succulent and yummy it is hard to describe! I prefer sweet, but only because savory does not agree with me too well! lol If possible, I would prefer an even blend of the two, to accentuate the meal, and liven up the palate’! This is a tough one but I prefer savory only until the sweets are offered. I would have to say I prefer sweet! I’m a teacher and every day for 2 weeks right before Christmas break, all the faculty/staff bring sweet treats for every one to try out. Savory wins it for me! I’d pick extra stuffing over a dessert every time! I actually like both…depending on my mood. I am a grazer so I like bites of things throughout the day and, although I am not a fan of pumpernickel, I definitely like the idea of salmon mousse on crackers and I love scalloped potatoes and using sweet potatoes isn’t something I have ever thought of so I would love to try that as well! Thanks for the giveaway and Happy Holidays to everyone! p.s. It would be more helpful to those of us receiving the e-mail notifications if the messages actually came well BEFORE the giveaways end, lol. I have always preferred sweet, especially anything with chocolate!! I like savory dishes. But let me be honest. I also like sweets. As I am a diabetic I am learning how to cook with Splenda or another sub. So that I don’t hurt my readings. If I can have a dish that is sweet without the sugar, well then of course I like it!! Don’t make choose, please!! Sweet and savory combo is perfect for me. But if I have to choose, I would say savory. Savory means different things to different people, but to me it includes meaty, salty, non-sweet – it covers more ground than sweet. I love to cook especially during the holidays and loved the recipe for Scalloped Sweet Potatoes. I love including something savory and something sweet when I’m preparing a menu for a holiday celebration! I always find the guest love the different tastes and textures and how well they balance out the meal! I love Savory food – I can certainly eat more of it and it is probably healthier than sweets – tho it’s lovely to have just a bit of scrumptious sweet to finish off the day. All in with Savory. The food just melts in your mouth. I love both, I have to admit, but my sweet tooth wins out every time. I love sweet. I don’t eat much sweets but during holidays or celebrations I enjoy the desserts the most. But when sweet and savory are combined it’s all the better. It is hard to respond by 9AM on Dec. 7 when the email arrives at 10 AM on Dec. 7.
thank you for the chance at such a great giveaway. i prefer a little of both for the holidays. i also have a large family that have a variety of likes so i have learned to cook a lot of different dishes of both the sweet and savory varieties. I prefer savory, it seems healthier. I mostly bake for events, everyone loves sweets. I prefer sweet. I love to bake especially with Christmas around the corner. Its time to start cranking out haystacks and pie. Savory all the way! I could eat soups / stews 365 days of the year. Around out house we call it stoup (we have it so often we don’t bother deciding which).